Say hello to Sony's newest games console. Not ready to shepherd in the next generation with PS4 quite yet, the Japanese tech giant instead opts for a trimmed-down take on the PlayStation 3 - a 'super slim' model that makes even the last iteration of the console, the PS3 Slim, look a bit chunky. Sony is obviously a fan of Apple's 'The New iPad' naming convention, but we're going to go ahead and stick with 'PS3 super-slim.' After all, it's 20% lighter than the 2009 PS3 Slim at just 2.1kg, and 20% smaller too. The internal architecture's been completely redesigned to facilitate the shrink, although the only real change in terms of specs comes in the storage department. There's a 12GB SSD model available in the UK for a reasonably £160 with an optional 250GB dedicated HDD if you wish to upgrade your storage. Available in Australia and UK now, we're still waiting for Sony to confirm a US release for this entry-level model. The larger capacity 500GB model arrives in stores on September 28 in the UK and October 30 in the US, priced at £250 in the UK, $399.95 in Australia and bundled with Assassin's Creed III for $300 stateside. All models of the new PS3 super-slim are kitted out with all the same ports as the Slim - two USB ports at the front, HDMI and component video interfaces, optical (SPDIF) audio and Ethernet, although frustratingly there's still no HDMI cable included in the box. 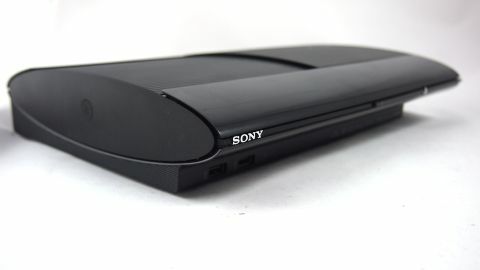 The big news in terms of its design, though, is that disc tray - gone is the touch-sensitive control from the original PS3, and even the bread-and-butter button from the Slim. Instead, the top of the drive slides open across the console's top, operated by a front-mounted button. It needs to be pushed closed manually, and that's sure to divide opinion on this latest Sony PlayStation. It certainly feels like a manufacturing cost-reducing measure to us. And that's a feeling that extends to the PS3 super-slim's overall presentation. If you thought the Slim looked and felt cheap next to the grand piano finish of the original PS3, you'll be singularly unimpressed with this console. If the exterior's meant to convey 'sleek lightweight,' it falls short at just plain 'flimsy,' and it doesn't look particularly hard to break the drive mechanism with a bit of clumsiness. If you listen to the rumours circulating industry-wide, the next genuine generation of consoles is likely to arrive in Q3/Q4 2013, which gives this new PS3 a limited shelf life. It's very likely a move on Sony's part to entice those who haven't bought previous PS3 models until now into its fold in preparation for the upcoming turf-war with Microsoft and (to a lesser extent) Nintendo, as all three giants release brand new consoles. And in fairness, now's a great time to do so if you haven't already. The PlayStation Plus subscriber service is getting better and better, offering an instant collection of top-notch titles such as Red Dead Redemption, and there are plenty of decent Sony exclusives such as Puppeteer on the way in 2013. But should you consider the super-slim PS3 if you already have Sony's gaming hardware in your home? Does SSD storage make that much of a difference, and is 12GB enough storage space today? Let's break down what's on offer.